I’ve talked about my abiding love for Rainbow Honey before, but gosh are the folks at Rainbow Honey Lab fantastic. And they’re based out of my native Jersey! Heck yeah. This is Rainbow Honey Lei Day, an adorable, fruity, carnation pink jelly… creme… crelly. Jeme. Jremly. It’s listed on their website as a creme, but it’s super jellyish and partially translucent. It makes your nails look all juicy and yummy. I personally love it, so you’ll get no complaints from me! I’m not wild about pinks, but this color is way more flattering on me than most shades of it! I saw Lei Day on sale in RH’s Last Call section and I knew I had to get it before it’s gone. Sidenote: Isn’t it sad that this is the longest that my nubby babynails have been in months? Tragic! Hey hey heeeeeyyy. I’ve got some photos. Let’s do this. My photos would have benefited from some sunlight, but I had to settle for the lightbox. This is three coats of China Glaze Dashboard Dreamer. It’s a pale blue—I can’t decide if it’s more periwinkle or cornflower—with shimmer that shifts between pink and gold, which my camera decided to hardly capture at all. Thanks, camera. I was a little annoyed to have needed three coats, but I don’t remember application being particularly troublesome. It was pretty to look at in the end, so I don’t really mind. 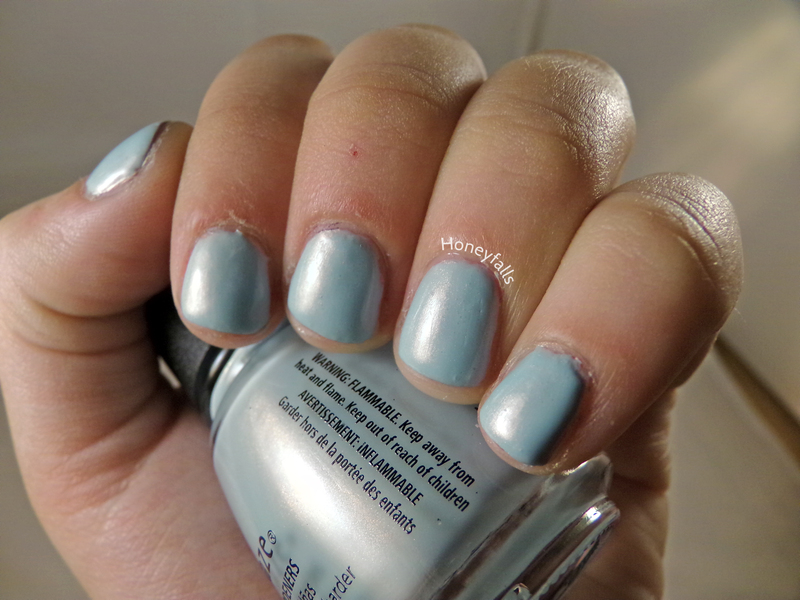 I’ve got some swatches and some simple nail art for you today! 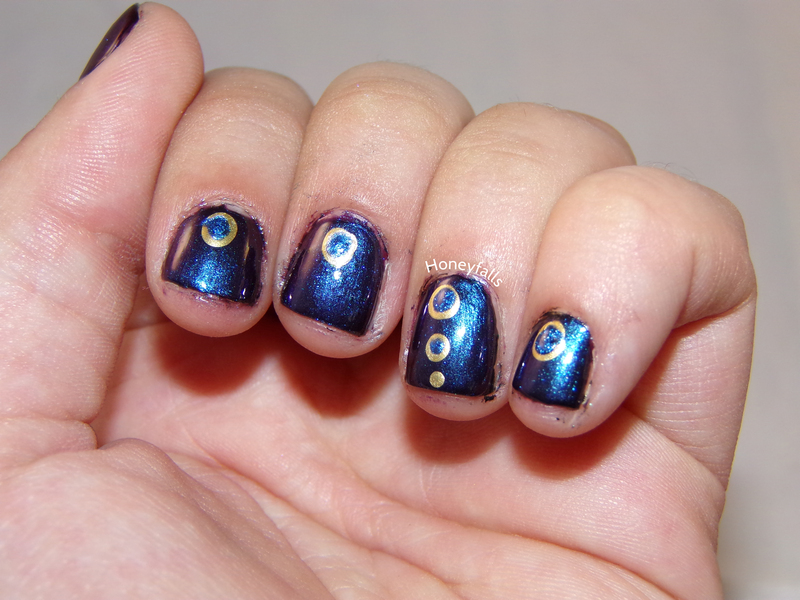 I wanted to liven it up a little bit, so I did some dotting nail art on it. I’m not crazy about any of this!! Oh well. There’s always next time! I’ve found the solution for my lighting problem in my new apartment—figuring out my camera settings to make my photos more flash-friendly, and a lightbox! I’ve since taken a looooot of photos with the lightbox (but have yet to post them because I’ve been lazy as sin), and it’s pretty fantastic. My first lightbox photos needed to be blingy and glittery! 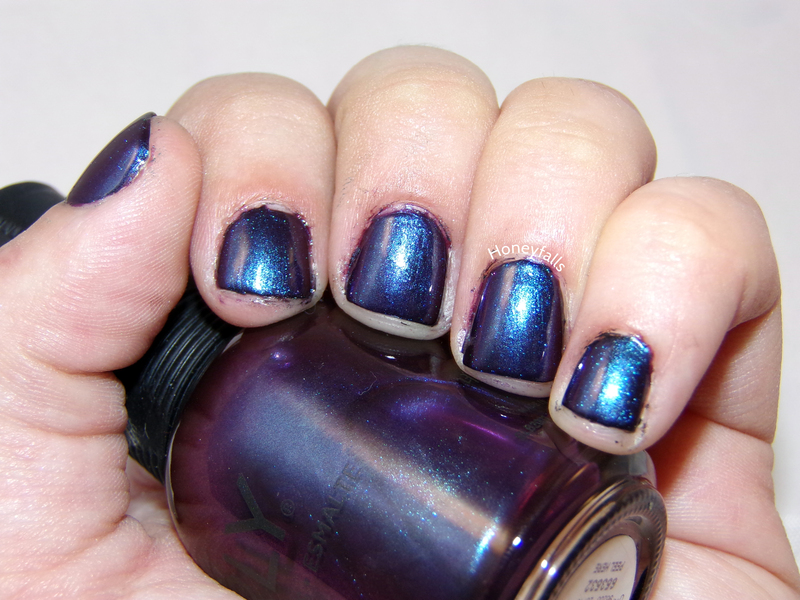 This is OPI DS Titanium. If memory serves me, this was two thin coats—I need to start writing this stuff down, because I have the memory of a goldfish with severe trauma to their limbic system. The base is translucent and gray-tinted, with some slight shimmer, and would take roughly a billion coats to get full coverage with. You’ve gotta layer this girl. This was over one coat of Revlon Chic, a blue-leaning slate gray. Titanium is beautiful and incredibly complex. There’s just a touch of silvery shimmer, tiny shifting round glitters, and small shifting square and hex glitters. The polish is absolutely packed with glitter, but I don’t recall having any problems with application. And if I’m not mistaken, it dried pretty quickly as well. But my point is, there’s absolutely no dabbing of any kind required with this; a painting motion will serve you just fine. 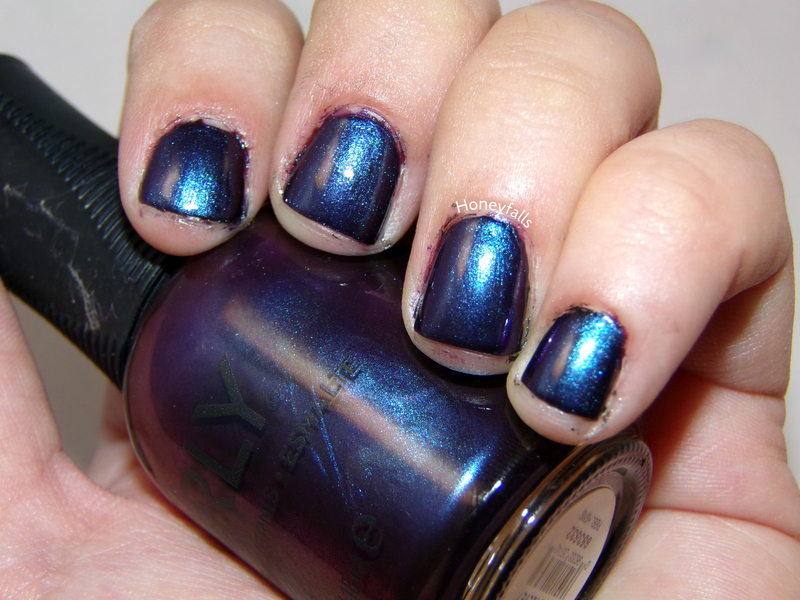 This was my first designer series OPI that I’ve ever worn! They were all very pretty, but none of them really thrilled me except for Titanium. What can I say, I’m a sucker for anything color-shifting. And they all apparently have diamond dust in them? Neat.